← Seven Things You Never Knew About “Frankenstein” (the novel)! Who was Jimmu – Japan’s First Emperor? Why is Feb 11 a national holiday in Japan? What does ‘National Foundation Day’ mean? Is it referring to the national constitution drawn up after World War II, defining what Japan’s government could and could not do? In fact it’s much older than that. The holiday is in honor of the foundation of Japan’s Imperial line which has (it’s claimed) stretched unbroken to today’s Emperor of the Heisei Age, and his son, the new Emperor-in-waiting who will take the throne in 2019. So who was the very first Emperor of Japan? Who founded the nation that would become known as the ‘Japan’ that we recognize today? His name was Jimmu, and he is said to have lived in the Yayoi Period. This historical era (named after an area in Bunkyo-ku, central Tokyo, where an archeological dig uncovered a shell mound) ranged from 300 BC to around 300 AD, and could be considered Japan’s ‘Iron Age’. We know of him today because his life was recorded in the Kojiki (A Record of Ancient Matters, an account of Japan’s earliest mythology) and the Nihon Shoki (The Chronicles of Japan, a work including the lives of the earliest Emperors as well as the Creation myths). His reign, and the beginning of the Imperial line, is said to have begun around 660 BCE. Jimmu was the son of Nigini-no-Mikoto the grandson of the sun goddess Amaterasu Omikami, and so he can be seen as an extension of the Shinto belief of a universe tending away from chaos and toward order. Jimmu is the bringer of stability and a coherent identity for Japan, and the beginning of a line of rulers who would oversee the nation far into the future. According to the Kojiki and Nihon Shoki, Emperor Jimmu was born on February 13, 711 BCE and died on March 11, 585 BCE. Jimmu and his older brothers were born in Takachiho, the southern part of Kyūshū (modern day Miyazaki prefecture). At some point after Jimmu reached adulthood, his entire clan had a revelation regarding their destiny; they were the ones fated to make the lands from Kyushu to far Hokkaido one nation, with one people, under one ruler. At first, the migration to the east across the mainland of Honshu was led by Jimmu’s brother, Itsuse no Mikoto, subjugating the local clans as they marched. When they reached Naniwa (modern day Ōsaka), they encountered another local chieftain, Nagasunehiko (“the long-legged man”), who proved to be the most formidable opponent they’d met; Itsuse no Mikoto was killed in the ensuing battle. 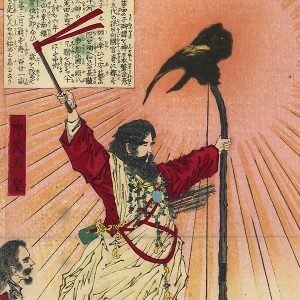 The leadership fell to Jimmu, and Amaterasu sent the three-legged crow, Yatagarasu, a supernatural creature with mystical powers, to assist him in his campaign. With Yatagarasu’s help, Jimmu realized they’d been defeated because they battled eastward against the sun, so he decided to move to the east side and battle westward. Jimmu, armed with his distinctive longbow as his weapon of choice, faced Nagasunehiko again, and slew him on the battlefield. After this batle, the remaining clans of Honshu surrendered and declared their allegiance to the victor. Jimmu also became the official guardian of the Sanshu no Jingi (the Three Sacred Treasures of Japan, the symbols of Japan’s mythological past) handed down through Ninigi from Amaterasu herself. The new Emperor scaled one of the mountains at Nara to gaze across his domain. A mosquito then tried to bite him but was instantly killed by a dragonfly – signifying that the land itself was now part of Jimmu, and would act as one body, one soul, to defend itself. In honor, Jimmu named the new country Dragonfly Island – Akitsushima. According to the Kojiki, Jimmu’s coronation as Emperor was held in Nara prefecture, and he ruled until he was 126 years old. On his death he was succeeded by his son, Emperor Suizei. It’s not known where Jimmu was buried, but in 1889 Kashihara Shrine was established in Nara Prefecture, in the spot where the coronation was said to have taken place, to house his kami (spirit). Most contemporary historians doubt that Emperor Jimmu was ever a real person. Indeed, it’s impossible to confirm the existence of the first nine Emperors. The first Emperor who is universally recognized to have been a living person is the 10th Emperor, Sujin, in the 1st century BC. There’s an interesting theory, however, linking the legend of Emperor Jimmu and a Chinese explorer called Xu Fu. Born in 255 BC, Xu Fu was the court sorcerer to the first Emperor of China, Qin Shi Huang. Qin Shi Huang was obsessed with his own mortality and sought to find the elixir of immortality. Xu Fu, as a prominent mystic at the court, was entrusted with a mission to sail east and find a sage called Anqi Sheng who was said to be more than 1000 years old. After adventures journeying in distant lands and encountering fantastical creatures, Xu Fu disappears from the records, never returning to China. Some scholars have speculated that he landed on a foreign island and made himself king. Xu Fu is also worshipped in Japan as a deity known as Jofuku (徐福), and the Japanese themselves believe that Xu Fu landed on the Kii peninsula of Honshu, just as Jimmu did, in the same historical period. Japanese legend relates how Xu Fu introduced agriculture and medicinal plants to Japan, hence he is venerated as the god of farming and medicine.This was a time when the indigenous Jomon period was giving way to the Yayoi period, a major leap forward in terms of social progress, leading to Japan becoming a true civilization. The scholar Ino Okifu formed a theory that merged the two countries’ respective legends, and came to the conclusion that Xu Fu and Emperor Jimmu were the same person. Needless to say, mainstream scholars have dismissed this speculation as groundless. If it were true, it would implicate the Imperial line as being descended not from the Sun Goddess, but a Chinese refugee. This is not an idea the Japanese establishment would like to consider (and that’s putting it mildly)! Archaeology is forbidden on the burial mounds in question, out of respect for the former emperors and empresses, so it’s not likely that the puzzle will ever be solved. After several centuries of rule by the military Tokugawa administration based in Edo, in which the Emperor was sidelined to being a puppet figure, the Meiji Restoration restored power to the Emperor and enshrined him as a living god, the head of the Shinto religion. In 1873, a holiday called Kigensetsu was established on February 11. The holiday commemorated the anniversary of Jimmu’s ascension to the throne 2,532 years earlier. The status of godhood was officially revoked after Japan lost the Pacific War in 1945, and the celebration of Feb 11th was suspended. It was reinstated in 1966 as National Foundation Day. Surprisingly, there isn’t much on Jimmu in popular culture. There is the manga “Jimmu” written by Yasuhiko Yoshikazu which ran from 1992 to 1995, but that’s about it – there’s nothing like the body of fiction inspired by King Arthur and Camelot, for example. Japan has always been very sensitive about its Imperial family, and rarely holds it up to scrutiny, either in documentaries or fiction. There is still a substantial right-wing element in Japanese society, who react aggressively if they feel the Imperial line has been treated with even the slightest disrespect. So maybe that’s the reason why there’s no CGI blockbuster showing the First Emperor fighting rebels and demons with his longbow and crow spirit familiar. If you’re aware of any novels, comics or films, however, Excalibur Books would really like to know, so please leave a comment. In the meanwhile, we raise a glass of sake to Jimmu the First Emperor on Feb 11 and 12, as we take a one-day break from the rush hours and overwork! If you’d like to know more about Japanese Mythology and the three mysterious artifacts known as the ‘Sanshu no Jingi’, take a look at the fantasy trilogy “Sword, Mirror, Jewel”. 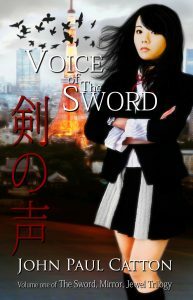 Book 1, “Voice of the Sword”, will be on sale for $1.99 through Feb 20!